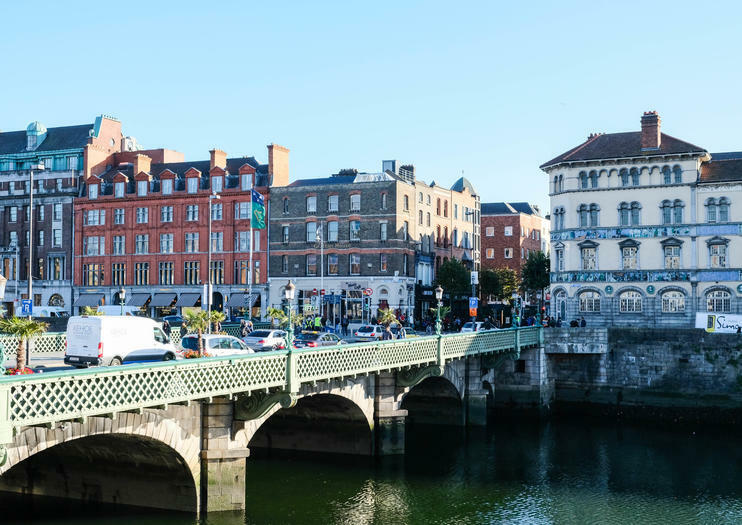 Small though it is, the Irish capital radiates an outsized charm and offers myriad attractions and cultural experiences. If your visit to Dublin is a quick one and you’ve got just one day to spare, here are the experiences you should include on your 24-hour itinerary. With such limited time, you’re not going to want to waste a minute figuring out where to go and how to get there. A guided tour of Dublin city center ensures a morning of efficient sightseeing, covering top historical attractions, such as Dublin Castle and prestigious Trinity College, home to the ninth-century illuminated Book of Kells manuscript. If you’d rather pick your own highlights, join a hop-on hop-off bus tour and choose where you want to disembark, be it St. Stephen’s Green, Christ Church Cathedral, St. Patrick’s Cathedral, or Croke Park. Next, peer behind the scenes of Dublin’s drinks industry. The city is the proud producer of two of Ireland’s most famous alcoholic exports: Guinness and Jameson whiskey. At the Guinness Storehouse, browse interactive exhibits and sip a pint of the black stuff while taking in the views from the seventh-floor Gravity Bar. Superfans can upgrade to sample Guinness beers and variants as well as the classic stout. If whiskey is more to your taste, head to the old Jameson Distillery Bow St. instead. Depending on timing, you may be able to fit in visits to both—pre-purchase skip-the-line tickets to save time. Though not traditionally known for its cuisine, the capital has undergone a restaurant renaissance in recent years. Join a guided food tour and sample dishes at several different eateries around town, many of which are off the tourist radar. Once you’re suitably filled, delve into Dublin’s darker side with a late-night ghost tour that visits graveyards, crypts, and other haunted locales. If you’re too spooked to go straight to bed after that, squeeze in one last nightcap in a Dublin pub—you’ll find lots to choose from in lively Temple Bar. Skip the line and experience the age-old tradition of Ireland's Guinness brew during this connoisseur taste experience at the Guinness Storehouse. Spend 75-minutes in the luxurious bar and enjoy a guided tasting session with samples of several Guinness blends. Choose your favorite and enjoy a pint with a view at the Gravity Bar. Once you're finished, explore the museum at your leisure and learn about the history of one of Ireland's favorite beers. This tour option is perfect for beer-lovers who want to experience the best of Dublin's darkest brews. Discover Dublin’s dark side on this terrifying 2-hour bus tour of the city’s most sinister spots. Scour the serpentine streets for restless souls as you venture around the capital with an entertaining guide; hear tales of mystery and murder as you visit some of Dublin’s most haunted spots, listening to the spine-chilling stories associated with each eerie enclave. Wander the ghostly St. James’ Graveyard under the cloak of darkness and descend into the depths of the atmospheric crypt at Christ Church Cathedral for a scary surprise. Ireland is world renowned for a certain beverage—Guinness. Get insider access to what happens behind-the-scenes at the Guinness Storehouse by going on a guided tour. You’ll learn about the ingredients, the brewing process, and taste samples too. By going on a guided tour, you’ll be able to ask questions and learn more along the way. The tour even teaches you a valuable hands-on Guinness life skill—how to pour the perfect pint.